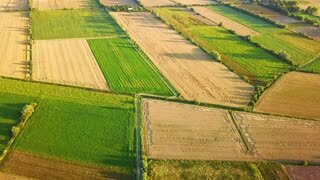 Drone shot of beautiful nature pattern of green spacious terraces on agricultural plantation in summer bright sunlight. 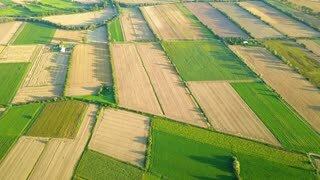 Aerial shot from drone of spacious terrain with green terraces and plantations in bright and soft summer sunset light. 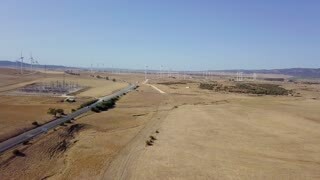 Shot taken with drone of spacious desert with plenty of windmills producing energy and plantation with roadways in bright sunlight. 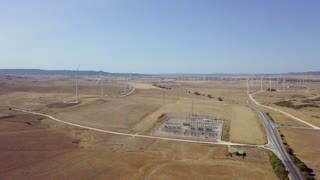 AERIAL CLOSE UP: Single wind turbine in a windfarm rotating in windy weather. 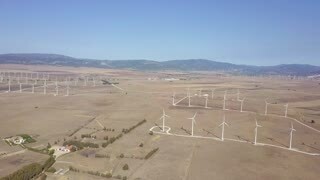 AERIAL CLOSE UP: Large white metal propeller blades spinning in windy weather. 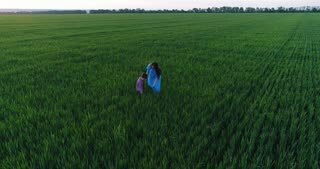 Shot taken with drone of spacious terrain of desert with plenty of rotating white windmills on industrial plantation in bright sunlight.